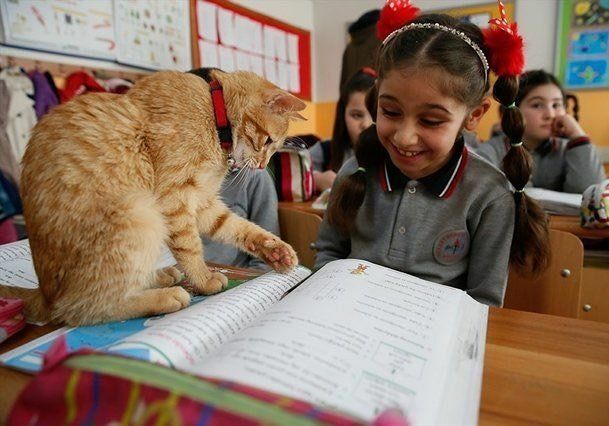 Mary took her lamb to school, but this cat went all on his own. Where he came from, no one knows. But after a somewhat rocky start, Tombi the ginger cat knows just where he belongs! 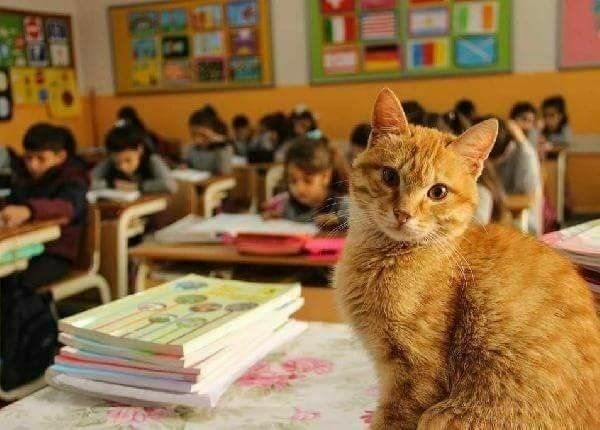 Found in the school's garden in Izmir, Turkey, a pretty ginger kitty joined an elementary school and decided to stay. 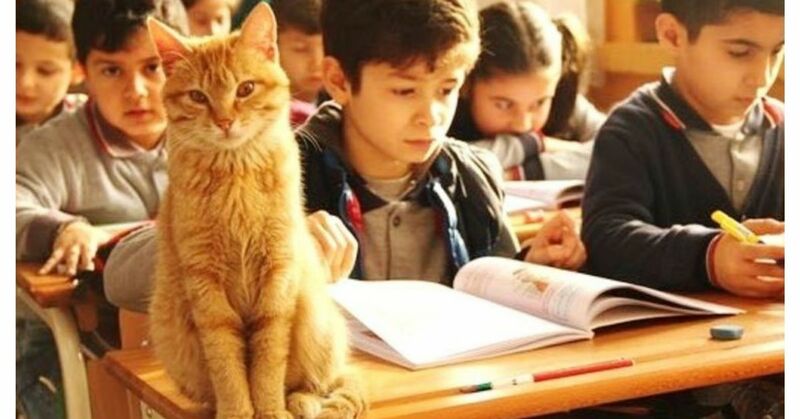 Özlem Pınar Ivaşcu taught third grade at the school and couldn't have been more surprised when the cat walked into the classroom like he belonged there. The kids were excited and the cat loved all the attention. "He started coming into my class and the children enjoyed his presence," Özlem remembers. "When he first joined our class, I noticed a change in the children's behavior. They were more careful and stopped running around in the classroom. They couldn't wait to come back to school the next morning (which is remarkable for some 9-year-old children)." "Unfortunately, one of the parents didn't agree to have the cat around the kids." Although the kids were sad, they all decided to share Tombi's story on Facebook in the hopes of finding him a good home. 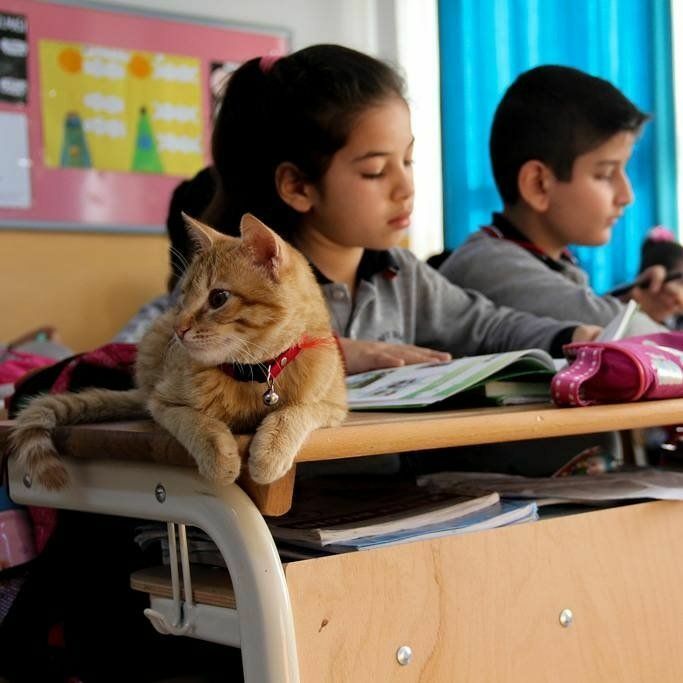 To prepare him for his new home, Özlem took the cat to a veterinarian to have him vaccinated. The kids went along with their feline friend. They found him a good home in Izmir, but Tombi was unhappy. "He didn't seem to be happy in the house and didn't get along with the other cat already living there. For three days Tombi didn't eat almost anything. So together with my husband, we decided to take Tombi back and kept him in our house," Özlem related. 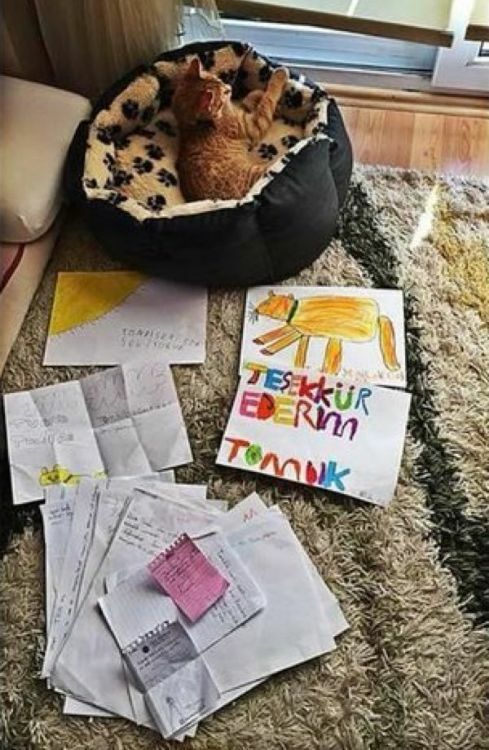 The kids missed their feline buddy and wrote letters and drew pictures to cheer him up. Pretty soon, Tombi's story spread all over social media. The school administration heard the story, and eventually the parent who had objected changed her mind. So Tombi went back to school! "With their great support, we decided to return Tombi to school," Özlem said. Coming back into the classroom was all it took to restore Tombi to his former, happy self. The kids were so happy to have him back, and it was obvious that the classroom was where he wanted to be. Tombi is somewhat of a teacher, himself. 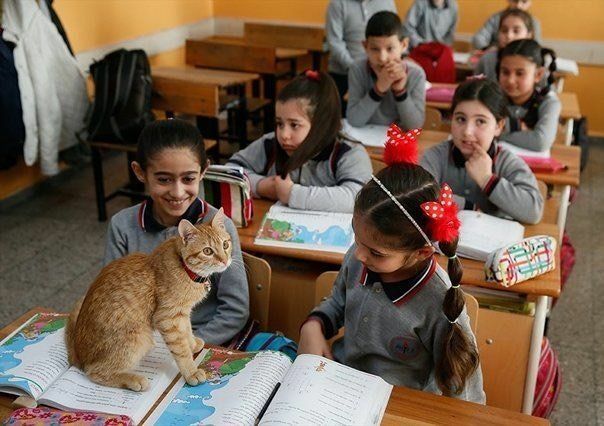 "Tombi has taught them to be more responsible," Özlem said. The kids have learned to be gentle with him, and that makes them better with all animals. "My husband and I love animals very much, and we hope the story of Tombi will raise awareness for animals like him," Özlem insisted. 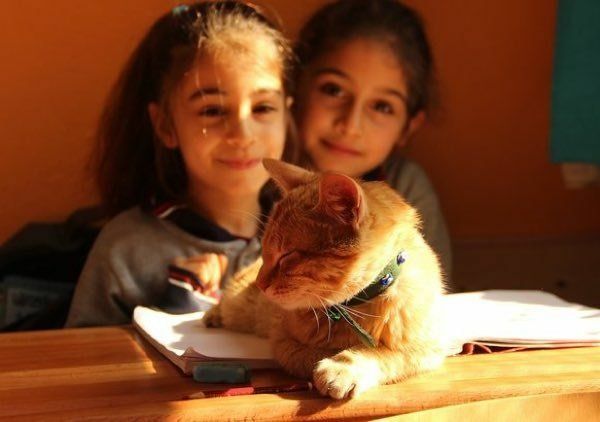 Now that Tombi's back where he belongs, things have settled back into routine, with a happy cat "assisting" the teacher and happy kids learning lots of wonderful lessons. Share Tombi's story with your friends. What do you think about his time away from "his" classroom? Was he mourning for his little school friends? I think so, don't you?